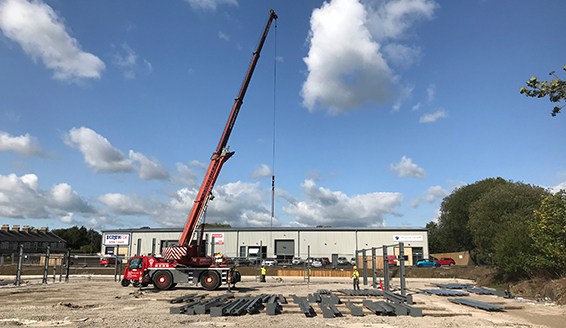 With a lack of supply of commercial buildings coming to market in recent years, it has become increasingly common for companies to have their own new building built on land that they already own, or to buy commercial premises off-plan from a Developer. Often a “Design & Build” form of contract is selected, whereby the client selects one firm to design the building and construct it too. In such circumstances, it is sensible for clients, who will often have little knowledge of the building process itself, to instruct an Employer’s Agent to act on their behalf, overseeing the contractor and protecting their interests in the contract. Alternatively, developers may appoint a contractor to complete the build, and the Employer’s Agent will therefore represent the interests of the developer. The role of the Employer’s Agent is most common in “Design and Build” contracts, typically of uncomplicated structures such as industrial units, where in order to keep costs down, the contractor takes design responsibility as well as building it. The Employer’s Agent role therefore encompasses several roles in one: including Lead Consultant, Project Manager and Cost Consultant. The Employer’s Agent is ultimately responsible for ensuring the works are undertaken to the client’s required standards, both in terms of quality, time and cost. The team at Lea Hough are well placed to carry out such monitoring roles for large construction projects. Utilising our expert knowledge as Chartered Building Surveyors, alongside our project management skills, we undertake the role of independent Employer’s Agent to provide advice and to protect the client’s interests during the whole of the development, from inception to completion. In the initial stages, Lea Hough’s building surveying team will liaise with all parties including the developer, principal contractor and designers, prepare any JCT contract documents including an Employer’s Requirements Document for design and build contracts. During the build, an Employer’s Agent will monitor construction standards on site and ensure compliance with contract drawings, along with monitoring programme timescales, certifying interim payments, and dealing with problems, unforeseen technical issues or variations on site. Prior to sign-off (Practical Completion) on the project, your appointed Employer’s Agent will conduct a final site visit to the completed property. During this final Defects Inspections, all aspects of the completed building will be cross-checked against the original plans. The Employer’s Agent will also ensure that all paperwork is in place as required such as Building Regulations approvals, providing reassurance to the client that the building is ready to be occupied. Lea Hough has acted in an Employer’s Agent capacity for both developers, investors and company clients, overseeing the successful completion of several projects. For more information on how appointing an Employer’s Agent can protect your interests in a project, or to discuss any of our other professional property consultancy services, please contact us.